Created to give recognition to outstanding achievements in Canadian fashion design, the inaugural Canadian Arts & Fashion Awards (CAFA) awards gala will take place on Saturday, February 1, 2014 at the Fairmont Royal York in downtown Toronto. The CAFA gala agenda includes a VIP cocktail reception, dinner, live entertainment, the awards presentation and an after party. Tables of 10 and individual tickets will be available for this inaugural awards gala. The opening festivities were held at the Ritz Carlton in Toronto on June 3rd, 2013. There’s a lot of support at the foundation for CAFA backed by many high-profile Canadian names such as Suzanne Rogers, Jennifer Bassett (Bassett Events), Elena Semikina (philanthropist, Miss Universe Canada 2010), Glen Baxter (CTV’s In Fashion), Glenn Dixon (designer), Dr. Sara Diamond (President of OCAD University) and partnerships starting with OCAD University. 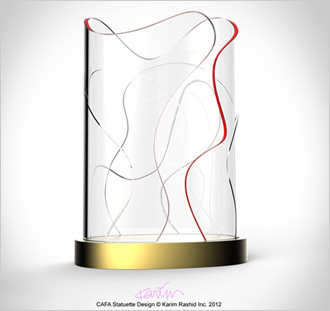 The CAFA award is designed by a collaboration with celebrated Canadian designer Karim Rashid and NovaScotian Crystal of Halifax, so it’s a work of art in itself. Sponsorship opportunities are available. Check out cafawards.ca and stay tuned with us for more info! The Menswear Designer of the Year Award will be presented to an outstanding Canadian menswear designer who has made a significant creative impact in the Canadian fashion industry. The Emerging Talent Award will be presented to an innovative Canadian designer who is emerging as a true creative force in Canadian fashion. The Outstanding Achievement Award will be presented to celebrate the exceptional career of an established Canadian fashion designer. The Canadian Style Award will be presented to a Canadian who embodies the spirit of Canada and acts as an unofficial ambassador for Canadian fashion and culture. The Image Maker Award will be presented to an outstanding Canadian fashion photographer or filmmaker who has made a significant impact within the Canadian fashion industry. The Stylist of the Year Award will be presented to an outstanding Canadian fashion stylist who has made a significant impact within the Canadian fashion industry. The Model of the Year Award will be presented to an outstanding Canadian model who has made a significant impact within the Canadian fashion industry.